The Akshardham Temple is 28 kilometers from Ahmedabad. It is one of the finest contemporary Gujarat temples in India. The temple is dedicated to Lord Swaminarayan and inspired by Pujya Pramukh Swami Maharaj. 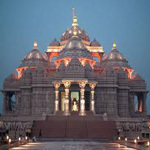 Akshardham is located in Delhi in the city New Delhi near the Nizanmuddin Bridge. Akshardham is the means of eternal, divine abode of the supreme God, the abode of eternal values and virtues of Akshar as defined in the Vedas and Upanishads where divine bhakti, purity and peace forever pervades. The temple of Ananta Vasudeva is situated at Bhubaneswar in Orissa state of India. The temple was originally constructed in the thirteenth century, and the images of Krishna, Balarama and Subhadra are worshipped there. The Asvakranta temple is located in north of Guwahati in Assam. The temple is one of the important and the greatest Vishnu shrines of Assam, the very famous Asvakranta temple is located on a rocky stratum touching the waterfront of the Brahmaputra. Ayodhya a very holy city located in Uttar Pradesh is an important pilgrimage site. Lord Rama was born and has spent many of His pastimes here. The city is said to have once had a perimeter of 96 miles and was the capital of Koshala day ago. The Balaji Temple is the situated in Nerul, Navi Mumbai which is built on the lines of Venkateshwara Temple at Tirupati and has been constructed according to the Shilpashastras. Baldeva Temple is located about 18 km southeast of Mathura which is one of the ancient temples in Uttar Pradesh. Banke Bihari Temple is one most scared temples at Vrindavan, in Mathura, Uttar Pradesh which was founded by the famous Hindu saint Haridas of Nimbarka sampradaya, who was one among the contemporary of the six Gosvamis. The Birla Temple which is dedicated to Lord Vishnu and Goddess Laxmi is yet another famous & major attraction in the Pink city of Jaipur. The Chenna Kesava Swami (Lord Vishnu) temple is situated on the banks of the Gundlakamma River. The Chennakesava Swami Temple originally called Vijayanarayana Temple was built on the banks of the Yagachi River in Belur, which is an early capital of the Hoysala Empire. The Dattatreya Temple is situated in Ganganapur, Maharashtra. The presiding deity in this temple Dattatreya is an incarnation of Lord Vishnu Dattatreya. Dattatreya temple is located at a very short distance of 1km from Murud. Dwarkadhish Temple is the most inexorable part of the religious shrines of Mathura. It is located in Mathura which is a small town in the western part of Uttar Pradesh. 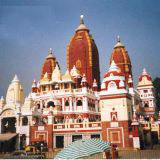 The Dwarkadesh mandir is situated in eastern part of Mathura. Govind Devjii Temple is one amongst the major tourist attractions of Jaipur. The Temple depicts the royal past of Jaipur. The Temple is dedicated to Govind Dev Ji which of one Other name of Lord Krishna.